If you’re searching for a healthier alternative to traditional sausage but don’t want to compromise on taste, look no further. Our antibiotic-free sweet Italian chicken sausage is loaded with cheeses and garlic you can savor in every bite. You’ll only taste the good stuff because Premio ABF Sweet Italian Chicken Sausage is made without gluten, fillers, preservatives or MSG. Pick some up at a grocer near you today. We’ve finally done it: brought three of the most incredible foods together into one package. We’re talking about chicken sausage, cheese and garlic. From the moment you bite into this tantalizing sausage, you’ll be swept away by a medley of fresh, fantastic flavors. Filler-free, this chicken sausage definitely belongs on the menu for your upcoming week’s worth of meals! Look at so many family recipes, and you’ll see cheese and sausage are paired in many ways. Now, we’ve made it easy for you to avoid buying cheese separately. Simply whip up any dishes with our ABF sweet Italian chicken sausage with cheese. The tang of the cheese plays delightfully against the robust chicken sausage flavor. Remember this is all-natural, great-tasting food you’ll love to share with your family and friends! Garlic and Sausage Make Quite the Team! Teaming up with chicken sausage and cheese is the much-loved vegetable, garlic. If you’re a garlic aficionado, you know no other ingredient can add quite the kick of full-bodied garlic. Plus, garlic adds a dash of vitamins and antioxidants to each piece of chicken sausage. 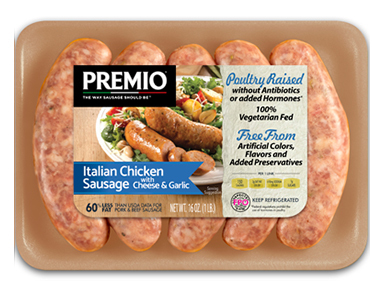 Eat up and indulge yourself in sausage The Way Sausage Should Be™ from Premio Foods. How many times have you wished you could switch up some of your family’s favorites with new tastes that accentuate your tried-and-true recipes? With ABF chicken sausage flavored with cheese and garlic, you can make substitutions that will “wow” everyone who eats your cooking. Instead of meatballs, add chicken sausage with cheese and garlic to any pasta and sauce. Or, try adding the chicken sausage to your next big platter of lasagna. Not only will the chicken sausage with cheese and garlic add a new taste to your lasagna, but it will also help bring out the flavors of your sauce and ricotta fillings. Want to rev up some of your soups over the wintertime? Dice pieces of chicken sausage flavored with cheese and garlic and add them to any stew or soup mixture. Noodle-based soups come alive with the good taste of chicken sausage. And veggie soups burst with protein goodness when you throw in some chicken sausage for good measure. Finally, don’t forget chicken sausage with garlic and cheese flavoring stands alone as a superior dish. Grill it, pan fry it, cook it in the skillet or bake it. No matter how you choose to prepare your chicken sausage, you can bet on getting tremendous compliments from everyone around your table!